Some big news, concerning the game, was released today. 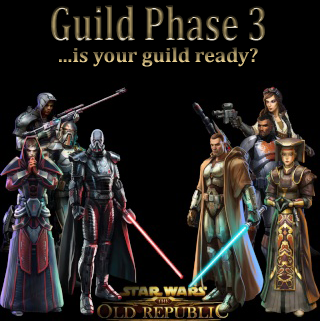 The first part of Guild Phase 3 is going on now! In dev notes, we look at what is going on and what your guild needs to have for Phase 3 done prior to launch. A smaller little “tidbit” from Stephen Reid, talks about news concerning Early Game Access will be released “quite soon.” Georg Zoeller also fills us in more on some of benefits in-game for Republic Gunslingers and Imperial Snipers. 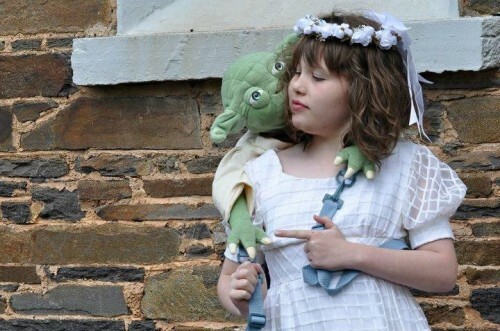 Not everything is serious news, on a lighter note we take a look at a heartwarming story of a flower girl and Yoda. Now as we make the calculations with the nav computer and prepare for the Jump, sit back and get ready for this week’s HoloNet Links. Last month we expanded our Pre-Launch Guild Program with the implementation of Phase 2: Alignment, where guilds could designate other guilds as allies or adversaries. Now, as Star Wars™: The Old Republic™ moves ever-closer to launch, we are excited to announce that we have initiated the first part of Phase 3: Deployment! Four members of the guild must have pre-ordered the game and redeemed their Pre-Order Code at the Code Redemption Center. PvP (Player vs Player) – Players are automatically flagged for PvP outside of the designated ‘safe’ areas (such as Origin Worlds, Capital Worlds, and the Republic/Imperial Fleets; see below for more info). RP-PvP – Players are encouraged to roleplay and act ‘in-character’ while playing on an RP-PvP server. Players are automatically flagged for PvP outside of the designated ‘safe’ areas (such as Origin Worlds, Capital Worlds, and the Republic/Imperial Fleets; see below for more info). The pre-launch Guild Headquarters currently allows you to select between three different server types for your guild: PvE, PvP, and RP, which will determine your server placement during Phase 3: Deployment. During Deployment, we will be placing all eligible guilds that select ‘RP’ onto RP-PvE servers by default. 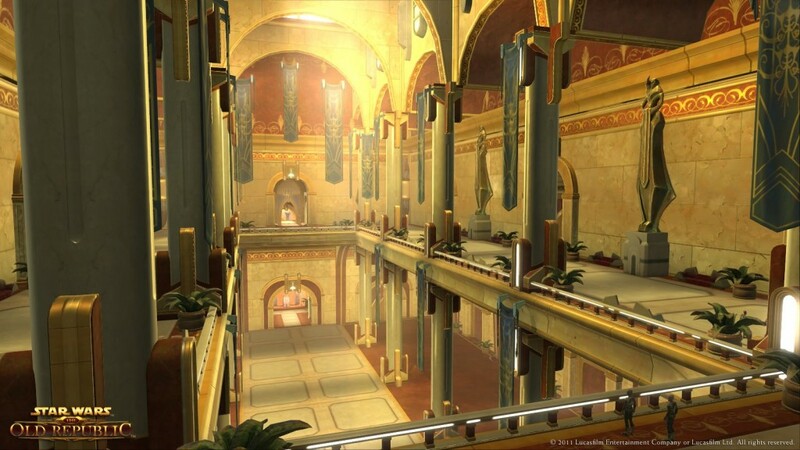 If a guild wishes to exist on an RP-PvP server, they will need to create their guild manually on a new server once they reach their Capital World (Dromund Kaas or Coruscant) and create their guild. Hopefully this post helps inform your decision as to which server type you’d like to play on at launch. If you haven’t already, create a guild on the Guild Headquarters so that you can get placed on a server before the game launches! We’ll be giving everyone an update on Early Game Access quite soon. This week Georg has much more to say than last week. He really makes some mentions about things built into game mechanics for Snipers and Gunslingers. Georg also lets you know exactly what will happen to a Sage Consular going against a close melee class, no punches pulled. GeorgZoeller Imperial Agent -> Sniper Range 30-35m? Why does the sniper carry a huge rifle with a scope, if a pistol has the same range? Because Gunslingers are trained to shoot with their pistol to great range, while the Sniper is trained to use technology that allows for great range shots. But honestly, and you already knew this, it’s about gameplay, not realism. From what I’ve read and i can’t remember the source off the top of my head the sniper’s cover is a counter for force leap, as it cannot be used on us in cover. 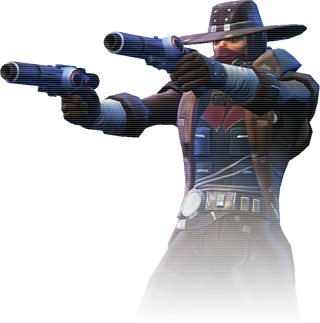 As far as dancing in and out of the range of the sniper’s abilities it’s a double edge sword because if in cover i believe snipers take little or no damage from ranged attacks. Eventually your healers going to run out of mana/energy/force points etc, leaving you the opportunity to burn them down. Also remember were going to have at least 1 stun or cc ability to help keep whoever were fighting within range for a bit longer. Remember snipers crit a lot and do huge burst damage! I have some mixed feelings about these game mechanics for Gunslingers and Snipers. If they have longer range than other classes and a cover system that prevents them from being damaged or able to be pulled from cover, it seems from my limited point of view that it might be a little unbalanced. I cannot wait to hear more on this as changes are being made before and at launch how all this works counter to the other classes. 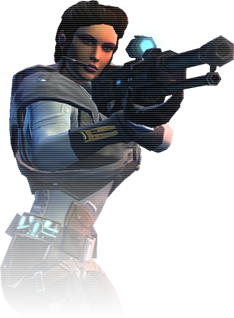 GeorgZoeller Jedi Consular -> How will the sage fair against up close melee characters? So have these comments from Georg changed your thoughts about trying the Sniper and Gunslinger classes? Let us know what you think in the comments below or in our forums. Dealing with fall gloomy days and can’t think of something to do or maybe just been busy running around to various festivals or parties… Well if you missed anything don’t worry a bit, Corellian Run Radio has you covered! Just below we have all the top stories just a click away. In Offbeat Bride, yes a man can find enjoyment reading an article in this publication, but I digress. This past month, Offbeat Bride had an article that was touching and fit right in with the Star Wars community. What do you do when the flower girl is having trouble getting over being shy and needs a bit of coaxing to come out of hiding? Well her aunt had the solution…a Yoda backpack, just like Luke had in Empire Strikes Back. Not only did the flower girl come out of hiding she was so attached to having Yoda right there in the backpack, she proudly walked down the aisle with Yoda “coaching” her along. Never mind the girl had autism, we all have times when we all need something or someone to helps get through our fears, and for this girl Yoda did just that. Here is a picture from the article, of the girl and her friend/teacher Yoda. Check out the article by Megan Finely, to help bring a smile to your face. This week’s image takes us back to Coruscant, again this time to the Senate. We see the beautiful architecture and lavish interiors of this governing body of the Republic. This week we have another fan created Star Wars music video. The unique thing on this video is that it takes us through the saga and has us “Turn Back the Clock.” It takes the viewer on an epic journey back the the beginning of the conflict we will be a part of in The Old Republic. I really enjoyed the narration, even if the voice was a bit rough. The video is well edited and makes use of music and footage from all the movies, scenes from the Clone Wars TV series and also parts from the cinematic trailers by Blur Studios. Nicely done by ChaserofTheDawn. Enjoy it in HD to get the full effect 🙂 Let us know what you thought of it in our comments below. That’s all this week from the HoloNet Links at Corellian Run Radio. I would love to hear from you all. Let me know what you liked or disliked or what topics you would like me to cover. I encourage you to send me any interesting, funny, or thought provoking Star Wars Old Republic link, via email at jason@corellianrun.com, or join us in the CRR forums, or in our Facebook group. See you next week!